Playing in a couple of challenges today with this "sweet" card. White background was embossed with a folder. Large chevrons were die cut as was the donut. I used Amplify! White on the donut, then heat set for its magical powers. I added the darling sprinkles and coated the whole thing with Pico Shimmer....it looks good enough to eat! This card is brilliant! the woven embossing folder is clean, simple but makes the card pop! 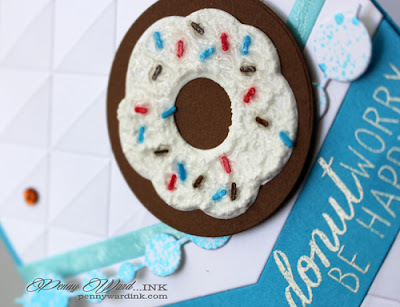 And tell me you didn't use real sprinkles on your card, they look fantastic! And how did you ever so perfectly ice your donut? Wow, this card really blows me away. Thanks for the inspiration! This looks good enough to eat, Penny! Love your design! Thanks for playing along with us at the Simon Says Stamp Wednesday challenge! SUPER yummy and awesome times amazing!!! Love the detail on that donut - yummy enough to eat!!! Way to go!! Absolutely Adorable, I'm loving that Donuts set more every time I see a card with it! I like the blue colors you used.